For some time MMS protocols have been listed on my websites. Some have also been listed on other websites and many “adjusted” or supposed “non-official” Jim Humble protocols have been floating around as well. I have spent the last three years or more writing my latest book, the MMS Health Recovery Guidebook. My intent with this book has been to have all the needed MMS information to recover one’s health in one handy and easy to follow volume. Scores of people worldwide have used and applied the principles outlined in my first books, or taught in seminars. As a result, over the years I have received a great deal of feedback from people around the world, much of which inspired me to get the MMS protocols updated based on lessons learned and much anecdotal evidence. In addition, I have wanted to clear up the misleading information on MMS put out there by some folks for a variety of reasons. I believe that it is vital at this point in time to lay out what we have learned in a clear and concise manner. (1) The protocols sorely needed to be re-written in a clear and concise manner. This last point is of utmost importance. MMS is a vast world, and while not really all that complicated, one needs to be aware of all the details if they hope to recover health. Many people write: “Just tell me the gist of this protocol or that protocol!” Well, I have come to the conclusion that giving bits and pieces of a protocol is a great dis-service to any sick person. The truth is, usually you need more than just one protocol to get well, and most importantly, you need to know other important details—the do’s and don’ts, to get the benefit of the protocols. Enough said. 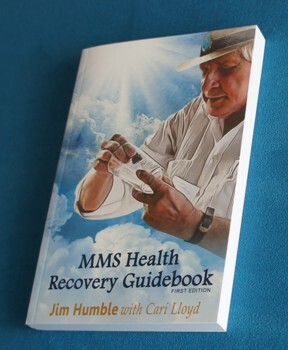 I encourage anyone who wants to get well to get the MMS Health Recovery Guidebook—where all my official and updated protocols are listed—and where you will find my Health Recovery Plan (HRP), a milestone health recovery plan, which I have determined after more than 20 years of working with thousands of people worldwide. Good health is serious business and for optimum health recovery you must have the complete picture…or at least as much as is presently possible. We simply cannot put all the information here on this website. We spent over three years working to get this guidebook to you (shown below). It covers 20 years of working with hundreds of thousands of people from around the world. Those people have told us what has worked best for them—and we boiled it down in this new book. But don’t kid me, because proceeds from the sale of my books go right back into helping others. I do not sell MMS or any other supplies of any kind nor do I receive any kind of a tithe or commission. I live a frugal life. I do appreciate gifts and contributions when they come. I thank you for doing your part to help others too.